World Parkinson’s Day on 11 April began in 1997 to commemorate the birth date of Dr James Parkinson’s, the man who first formally identified the disease nearly 200 years ago. Today, the whole month of April is celebrated as Parkinson’s Awareness Month around the world with some countries dedicating a week to the cause. Here’s a round-up of some of the events and campaigns that have taken place so far. 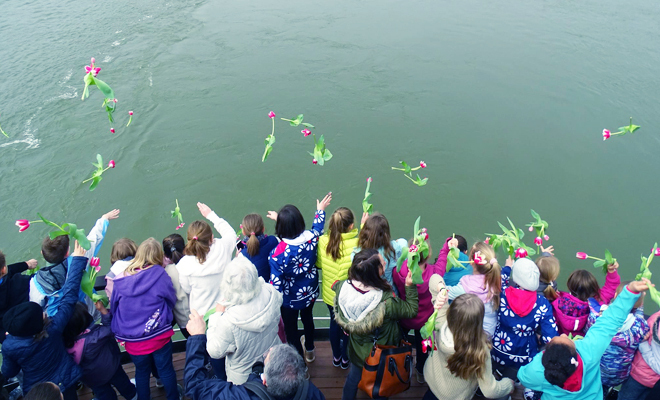 On 11 April, Delta Hungarian Parkinson’s Association organised a ship tour down the Danube River in Budapest to celebrate World Parkinson’s Day. The ‘Europe’ ship had a banner on each side sporting the words, ‘World Parkinson’s Day,’ and was decorated with 500 tulips and 600 balloons. Almost 400 people – people with Parkinson’s, carers, family, friends and supporters – joined the event. 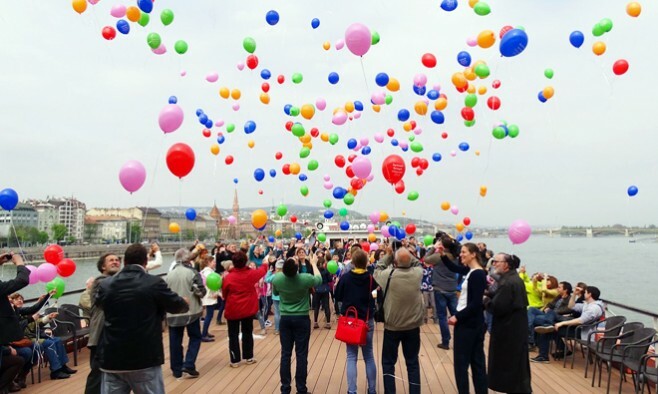 On-board the ship, messages of support to the Hungarian Parkinson’s community were read out aloud, while the balloons were then released into the air and the tulips – with the messages attached – thrown into the water, as a symbol of solidarity and hope for people with Parkinson’s. On 1 April, the start of Parkinson’s Awareness Month in the US, fashion blogger and young-onset Parkinson’s awareness campaigner, Tonya Walker – AKA The Shoe Maven – teamed up with Bloomingdales in Orlando, Florida and Team Fox, slipped on her favourite heels and began a social media awareness campaign called ‘Heels On Head Up’. In her campaign video she calls on women to take a picture of themselves in their favourite pair of heels and post to social media with the hastag #HeelsOnHeadUp to help raise the profile of young-onset Parkinson’s. Tonya, 40, is living with Parkinson’s and her blog has caught the attention of the global media and Parkinson’s organisations such as The Michael J Fox Foundation, where she is part of the Team Fox fundraising squad. Throughout April, the Orlando Bloomingdale’s store will donate 10% of supporters’ shoe sales to the MJFF. 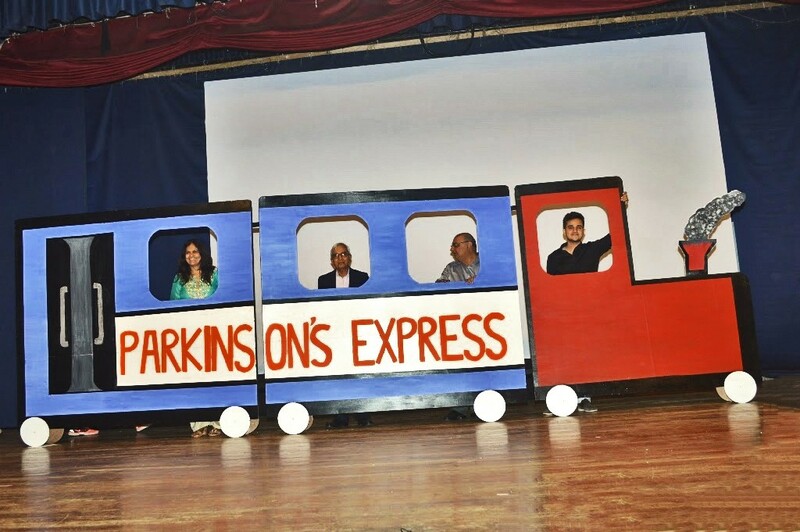 In Mumbai, India, people with Parkinson’s performed a musical drama titled, ‘keep moving in life’ (‘Chalti ka naam gaadi’ in the local language), an adaptation of the work ‘From Diagnosis to Fulfilment’ by Tom Isaacs. The performance took the audience on a journey from the pre-diagnosis stage of a person with Parkinson’s living in India, through to their empowerment. An audience of more than 400, which included people with Parkinson’s and their carers, saw the play. In the UK, 18-24 April is Parkinson’s Awareness Week. Leading charity, Parkinson’s UK, launched a social media campaign, ‘Parkinson’s in 1’ to get people talking about Parkinson’s and highlight the small things that make a difference to life with Parkinson’s. People are posting photos of the objects that hold special meaning in their Parkinson’s journey to Facebook, Twitter and instagram tagged #Parkinsonsin1 and telling the story behind it. 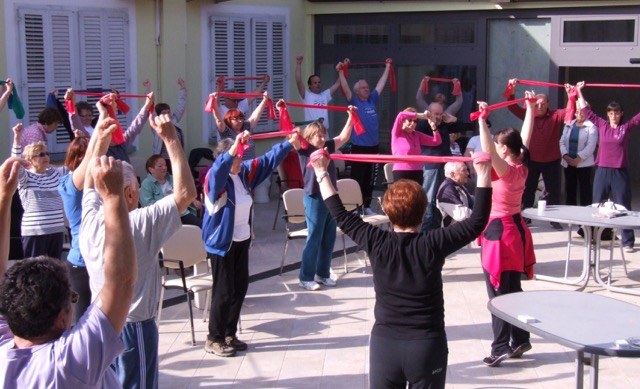 The Slovenian Parkinson’s association, Drustvo Trepetlika, was invited on to two national TV shows, where representatives spoke about activities to raise awareness for the condition. Drustvo Trepetlika also organised a brain-themed week from 11-16 April. 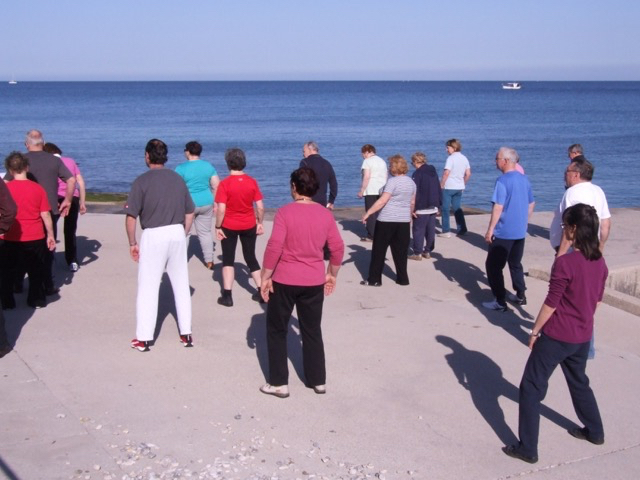 Highlights included intense training courses for its members, which took take place at a seaside resort in Slovenia. 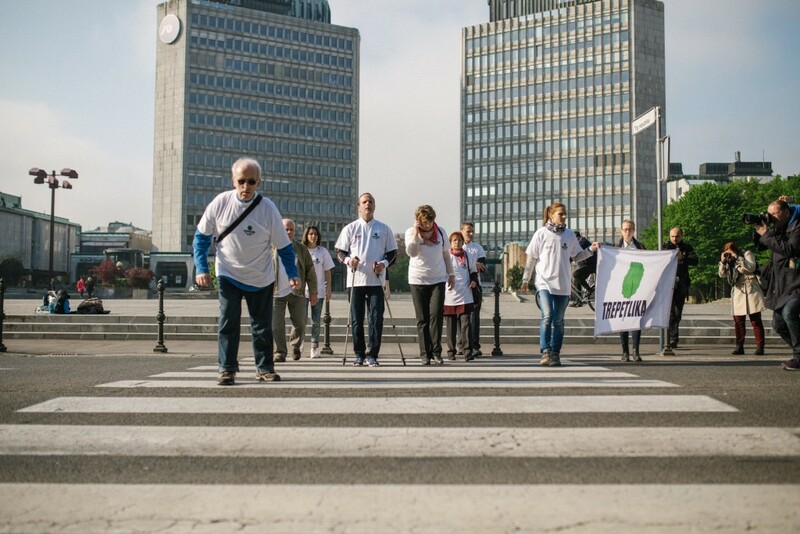 They also engaged in a street flash mob to demonstrate the effects of freezing, one of the most common motor symptoms of Parkinson’s, on the pedestrian crossing in front of the Slovenian Parliament. Dressed in T-shirts with the Trepetlika logo and carrying the association banner, they stopped traffic on one of the main streets in Ljubljana. A thousand people from all over Ireland, headed to Dublin’s Merrion Square, for the Unity Walk on 10 April. The Lord Mayor of Dublin, Críona Ní Dhálaigh also did the walk. Richie Kavanagh, who has lived with Parkinson’s disease since 2008, performed his recently re-launched hit song ‘Aon Focal Eile’, which spent seven weeks at number one in the charts in 1996. It is available online and in music stores now, with all proceeds going to the Parkinson’s Association of Ireland. 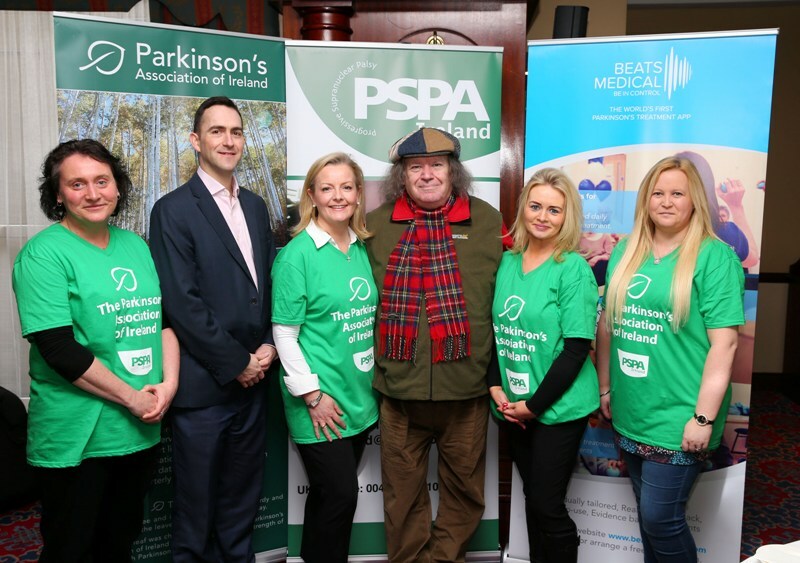 He is encouraging all his supporters and those affected by Parkinson’s disease to show their support for the Parkinson’s Association of Ireland. 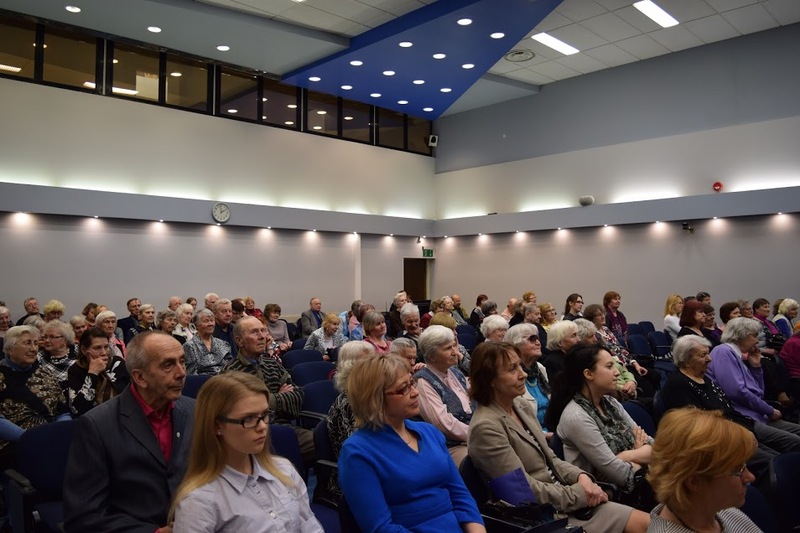 The Parkinson’s Day Conference in Estonia took place on 22 April in Tartu and was a collaboration between the Estonian Parkinson’s Association, Tartu Parkinson’s Disease Society and the Estonian Movement Disorders Society. Dr Tiina Tammik, head of Rehabilitation Centre of Põlva Hospital, spoke about the availability and options of rehabilitation in Estonia. Although Parkinson’s medication is fully reimbursed by the Health Insurance Fund there, other therapies are only partly reimbursed. Then there was a poetry session, presented by the author Jaak Kõdar and an actor Raivo Adlas, and also some music performed by a local disabled children’s drama club. There were about 120 participants in total – people with Parkinson’s, their friends and family members, and medical professionals. The Croatian Parkinson’s and Us Association (Udruga Parkinson i mi) presented a new book with information about advanced Parkinson’s disease in Zagreb’s main square. The book features information on coping strategies, treatment possibilities and multi-disciplinary healthcare teams. 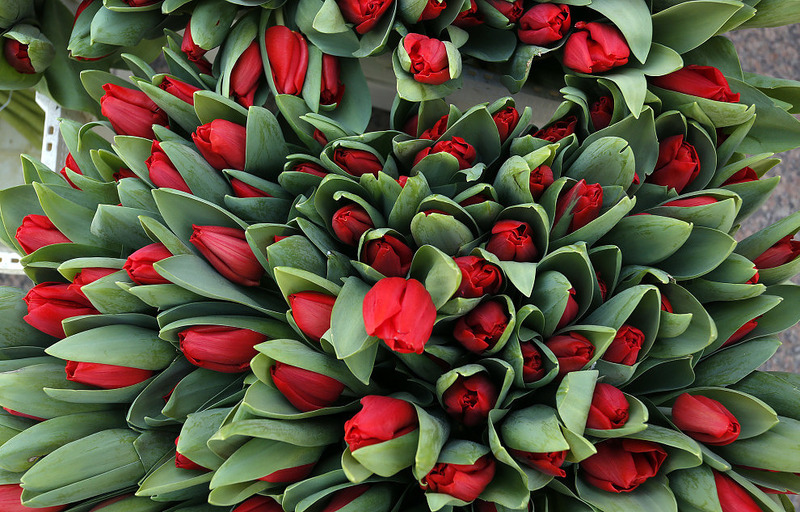 Members of the association shared bunches of beautiful red tulips with representatives of the Ministry of Health and National Health Insurance. Let us know about your awareness activities in the comments below!